Blind to Homelessness? Make Them Visible! Check out Reactive’s work on http://www.makethemvisible.com where you can find some beautiful portraits of real homeless people in New York. And donate to help. 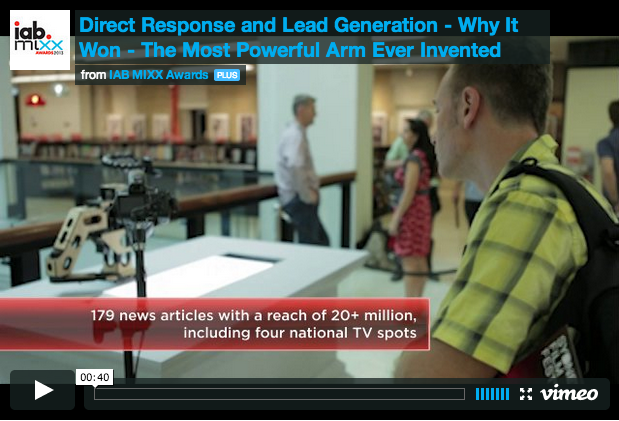 This project initially began through our trip to the IAB Mixx Awards in New York with The Most Powerful Arm. As part of being over there, we hosted ‘Tomorrow Evening’, an event with the Reactive NYC crew where we presented our work and thinking. This event in turn created a personal connection to indie agency Silver + Partners which led to ‘Make Them Visible‘. I think it goes to show that you can’t quite know what will come out of hosting creative events. Except that you’ll always make a few interesting connections. Among our latest work at Reactive is fresh content marketing for WeightWatchers. Understanding weight issues and weight loss as well as making healthier choices in your life has become a critical issue for Australians. By many statistics we rank as one the heaviest nations in the world. And that is tons away from our self-perceived ‘beach-bronzed surfer chicks and dudes’ ideal. Check out the various exercise tips, recipes and psychological advice in the University of Incredible or as a series of presentations on the WeightWatchers Slideshare account. YouTube videos and live events like Google Hangouts and Twitter chats with WeightWatchers experts complement the offering. Will have to correct the numbers below, as I am just writing this from memory. They rack up 2-3 million unique browsers in AU already and went from 2 to 10 million uniques and 22 writers in the UK in last year. Agencies like 1 Trick Pony, Barbarian Group or Mother are now training and employing brand copywriters to write specifically for places like Buzzfeed, tumblr etc. Additionally there is a (sold out) IAB event this Friday featuring Andy Wiedlin, Buzzfeed’s Chief Revenue Officer. Some of our discussion afterwards revolved around the role of an agency in the process, how BuzzFeed’s Top10-lists and quizzes might evolve creatively, the culture you need to build for such a quick publishing model and how ‘Native Advertising’ has become the new ‘viral’ – most don’t quite know what it tis, but everyone wants it in their marketing mix. 2013 was a busy year for our teams all over the world – and it shows in the recent list of AIMIA Award finalists. Reactive has been shortlisted in eight categories for five separate projects. 8 finalists is already a cool result – if I’m not mistaken the best agency in the running. But to score those across 5 different projects means we are excelling within a broad range of digital : from mobile shopping apps, social media on the tablet, innovative use of on- and offline, to massive websites with strong retail and CRM functionality. AIMIA, the Digital Industry Association for Australia, has represented the digital content, services and applications industry in Australia since 1992. Currently in it’s 20th year, the AIMIA Awards consistently recognise work of an exceptionally high standard. And this year’s shortlist is no different. Please wish us luck and maybe see you on the night of April 3rd ? Due to winning a few pitches for a line of cool brands I am seeking some talented creatives to join us. Please head over to our application page if you are interested in making your mark at Reactive Sydney. At Reactive we love design, useful things and great creative content. And we are already pretty good at it, judging from the many international awards we keep winning like Cannes, Spikes, TheFWA, IAB or Webby. 5 offices around the world with Sydney, Melbourne, Auckland, New York, London (international career anyone? and not least of all, a company-wide, 4 times a year Research & Development Day. But in the end, it’s all about the work. Your work, our joint (hopefully award-worthy) results and what you want to specifically achieve in the future. And here are two videos of myself speaking (at the Reactive office and at Ignite Sydney) pointing to the digital interface challenges of today. As we all feel on a daily basis,it’s all about The Touch now. If you are convinced, have a click through and let us know about yourself and your work! Spending a week in our Reactive New York office was crowned last night by winning a Gold at the IAB Mixx Awards. With me was Emad, Director of Creative Technology at Finch, a long time collaborator and mate.